Sotheby's, London, 24 April 1989, lot 182. The different colors on multi-colored overlay bottles can vary from two to as many as ten, although between two and five is the norm. The chi dragon was a popular subject for multi-colored overlay glass bottles, with each beast typically being depicted in a different color. The present example is an extremely rare variant in having the dragons vertically aligned, suggesting the "fluted" effect found on some courtly bottles from the late Qianlong period. Another rare feature of the present bottle is the division of the footrim into five segments, each a different color corresponding to the dragon above. With its imaginative and confident design, this bottle ranks among the finest of the genre. 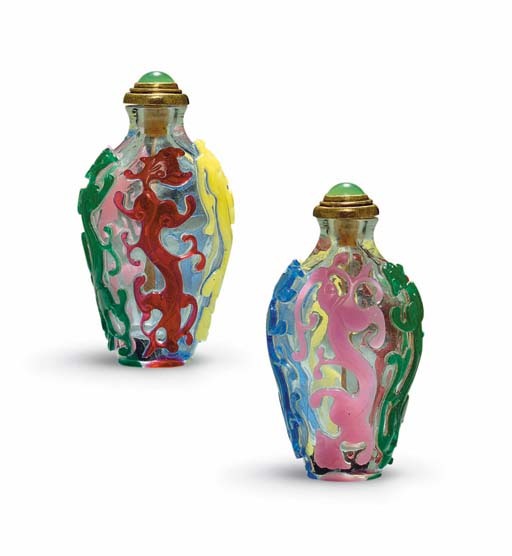 See also several multi-color overlay glass bottles carved with chi dragons in the collection of Mary and George Bloch, illustrated by Moss, Graham, Tsang, A Treasury of Chinese Snuff Bottles, Vol. 5, Glass, nos. 978, 981, 984 and 993.